Dwayne Wood behind the wheel of the "Heroin Hearse." Dwayne Wood estimates he has helped more than 40 addicts into treatment. Necia Freeman says, "We are all just one bad choice away from being who we're helping. One bad choice." A donor has made the purchase and renovation of this old, traditionally black church possible. Necia Freeman dreams of using it as a haven for her "girls" and for first responders. 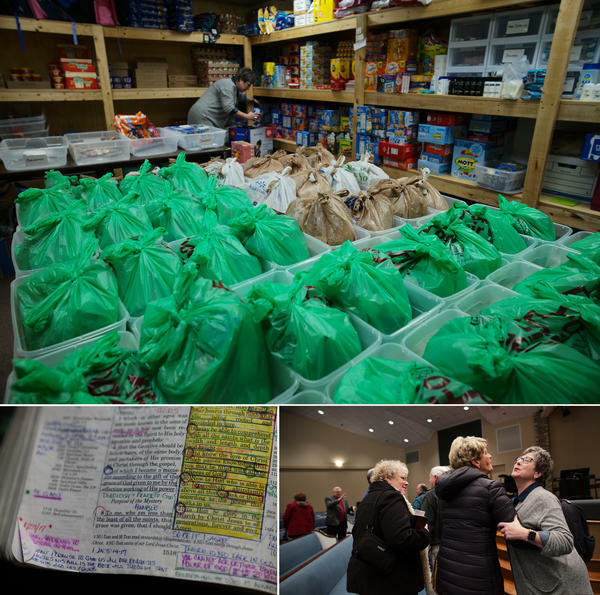 (Top) In a church annex, Necia Freeman prepares the brown bags to give to the women on the street. (Bottom Left) Necia takes notes in her bible. (Bottom right) Necia finishes up at her Bible study group. 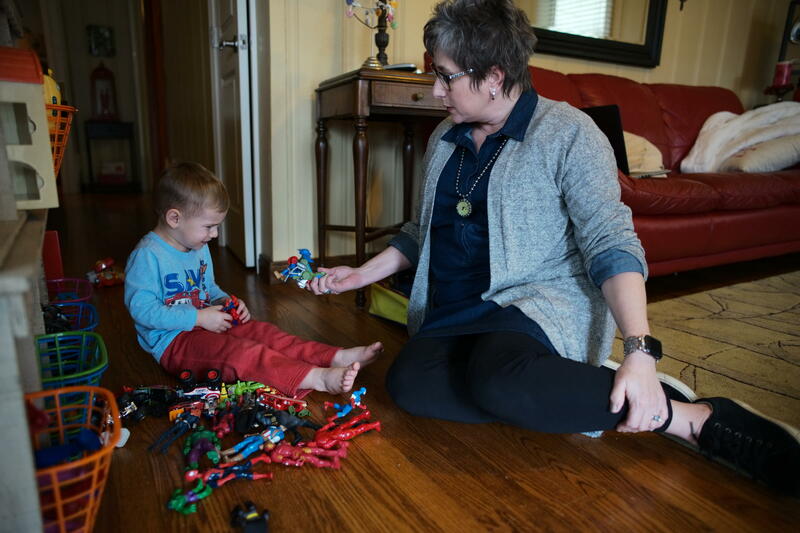 Every Wednesday, Necia Freeman babysits her grandson, 3-year-old Campbell Lusk. Necia is constantly on her cell, trying to balance the demands of her Relator life with her Mission life. 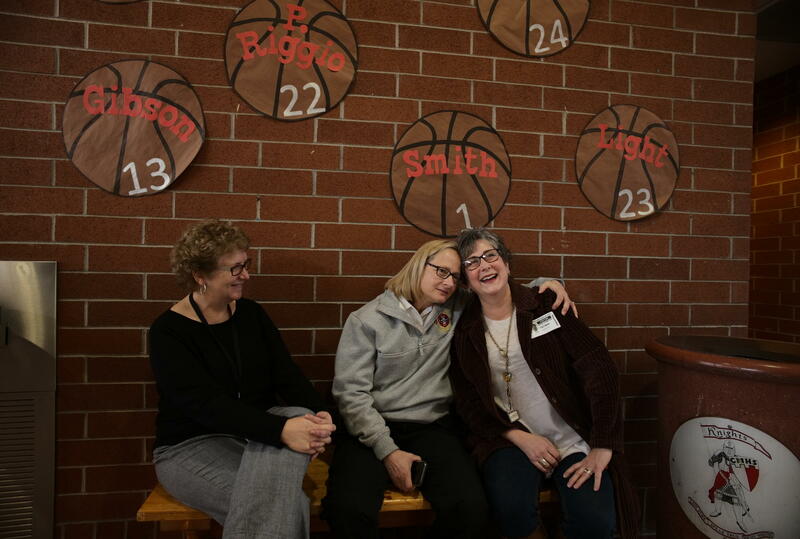 Three women who are leaders in the local fight against heroin: Judge Patricia Keller, Huntington Fire Chief Jan Rader and Necia Freeman, gather in a Huntington high school to deliver facts and support to the students. Necia Freeman offers help to women who are mothers, sisters, daughters in Huntington. 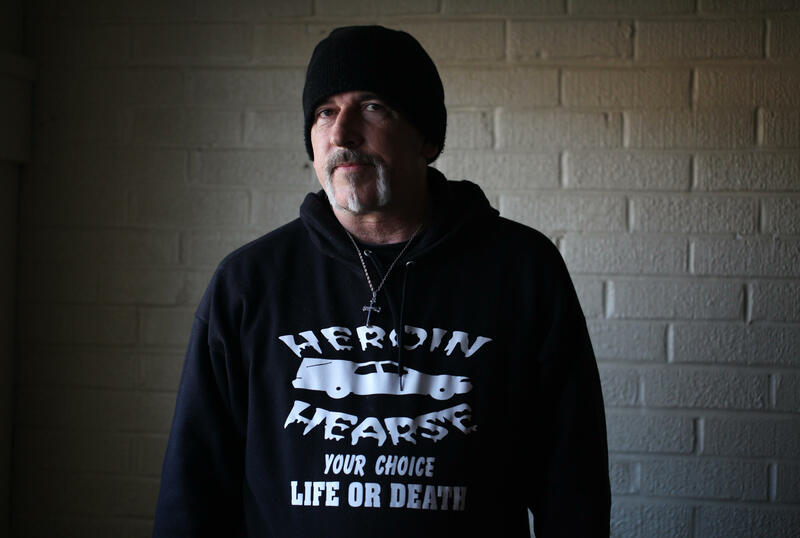 Each in their own way, has set out to get heroin addicts into recovery. Their methods are unorthodox. One uses brown-bag lunches and the Bible. The other, an old black hearse and a casket. Let's start with Dwayne Wood. And his hearse. A black, 1988 Buick hearse with the words "Inject Heroin. Reject life," stenciled on the side. On the back, it says "Heroin kills. Is this your last ride?" It's an ominous sight, parked in a rundown neighborhood where there have been a number of drug busts. 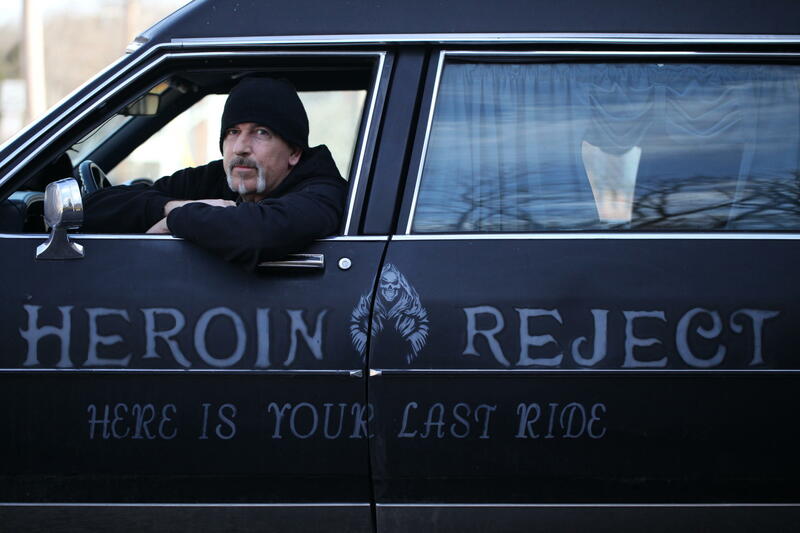 Huntington native Dwayne Wood drives the hearse thousands of miles through nearby Ohio and Kentucky to raise awareness about the dangers of heroin. "There's nothing around quite like this that I'm aware of," he says with pride. "But I wish they were on every corner." Wood originally bought the hearse to carry his motorcycle. "I love my Harley. How cool would that be to see those ape hangers stickin' out the roof of a hearse goin' down the road," he says. Ape hangers, as in handlebars. When he bought the hearse he'd planned to cut a hole in the roof to make room for them, but scrapped those plans on the drive home. "Radio airwaves once again filled with overdose and death," Wood recalls, shaking his head. "And that's when I knew the true calling of the car. The car that was designed to haul death was revamped to give life." Wood says the hearse is "a photo magnet." Images of it have spread online. He started the Heroin Hearse Facebook page, which now has more than 7,000 followers. He organizes fundraisers for treatment centers and talks to addicts directly. "Dwayne's actually the one that got us into rehab and here we are today," says Thomas. "Six months clean," his wife, Sarah, chimes in. For privacy reasons, we're omitting Thomas and Sarah's last names. In 2016, police raided their home. They were charged with "maintaining a drug dwelling" and "child abuse." Child Protective Services took their two children. After serving jail time, they started using again. A neighbor suggested they talk to Dwayne Wood. I met Thomas and Sarah in a two story building that was once a small grocery store. Wood is trying to turn it into a community center for recovering addicts. Sarah says she was still using when she first met Wood. "When I walked in here he already had my Facebook page pulled up and pictures of my daughters," she says. "The first thing I seen facing me was my daughters." Wood's office looks like it belongs in a haunted house. With black walls, a mock jail cell with iron bars and a shiny black casket donated by a local funeral home, the effect is intentional. "This is where you'll make your choice of life or death," says Wood without without a hint of irony. The son of a truck driver who makes his living building motorcycles, painting and other odd jobs, Wood uses a combination of compassion and fear to get through to addicts. It worked on Sarah. "Walking into that office, you know, will slap you in the face because he has that casket and he's not afraid to open it for you neither," she says. Wood even adjusted the casket to fit her and her husband's bodies. "My first thought was 'Is he going to put me in this casket?' " she recalls. "Because I don't think I could do it. Thankfully he didn't and all it took was for me to see it." There isn't much research on the best way to get an addict into treatment. It's not clear that using fear works. And with his garish black hearse, Dwayne Wood has his critics. But in a town like Huntington, where resources to fight the addiction are scarce, everyone needs to take ownership, says Mayor Steve Williams. "When I hear people, they come and say one of two things. Either 'Somebody needs to do something.' And I'll say 'Look in the mirror,' " Williams says. "Most people come and say 'What can I do?' " the mayor adds. "That's heartwarming." It's also "heart-wrenching," he adds, "because many of the people who say 'what can I do?' have either fought addiction themselves or lost someone to the disease." Dwayne Wood figures, in the last year, he's helped get 43 addicts into treatment. Some went to programs that included medication to beat cravings. Others went to abstinence programs. Medication Assisted Treatment has a higher rate of success, but Wood says any treatment is hard to find in the area. He doesn't know if the people he's helped are still in recovery. As a recovering alcoholic himself, he says he's compelled to help addicts because he relates to them: "They had dope sickness. I had alcohol sickness. Same symptoms they've had — when their legs were shaking and their stomach was tied in knots and everything else that goes along with it. I've been there. I've been beside them." Huntington is a mid-sized city on the Ohio River, where West Virginia, Ohio and Kentucky meet. It is home to Marshall University, several healthcare facilities and an Amazon call center. A number of factors have contributed to the city's opioid crisis, including the loss of factory jobs and a depressed economy. The mayor's office calls the city "a prime location for drug distribution." Necia Freeman and Dwayne Wood don't know each other. 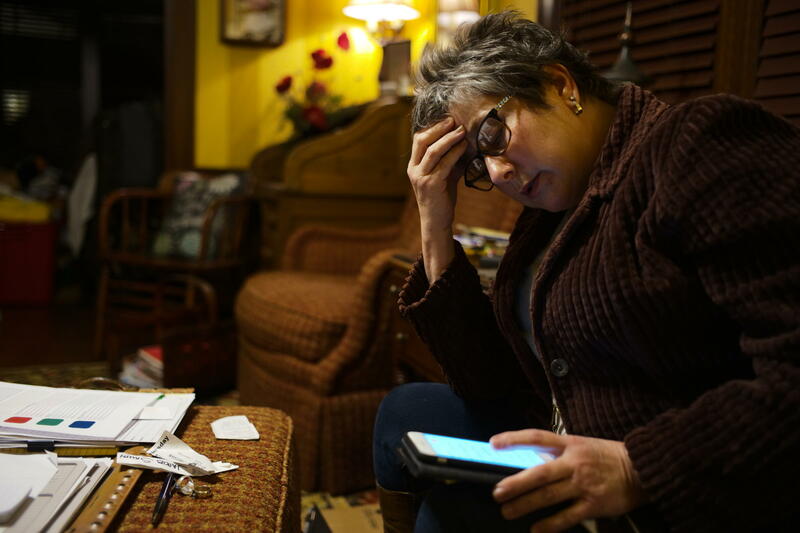 Freeman's a Realtor, and she sees the personal struggles of Huntington residents every day. "We are all just one bad choice away from being who we're helping," she says. "One bad choice." Freeman has taken a much different approach to helping heroin addicts — specifically, prostitutes working to feed their addiction. Freeman grew up just outside of Huntington. Her dad worked in a glass factory for 38 years before it shut down. 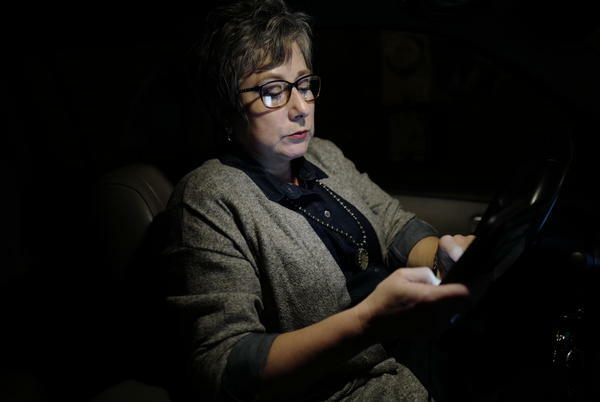 Driving around the city in her SUV, Freeman points out evidence of Huntington's opioid crisis. We pass a small building with the sign, Lily's Place, on the front. "That place is specifically for babies born to addiction that aren't able to come home," she explains. "Our neonatal unit is so full that we've had to open up a whole new facility called Lily's Place." Freeman is a devout Christian. About eight years ago she started "Back Pack and Brown Bag Ministries." With help from her church, she delivers brown bag lunches and backpacks to poor children in local schools. And that's partly what inspired her to work with women who are heroin addicts. One day she read a short item in the local paper. Just a couple of lines. The body of a known prostitute had been discovered in a corn field near Huntington. She'd been shot. The cursory nature of the article angered Freeman: "It bothered me that that was the end of the story. So I was burdened for this woman I didn't even know. And then, come to find a couple days later, she was the mother of one of my backpack kids." The revelation made her want to reach out to prostitutes. So now, one evening every week, she delivers brown bag meals and scripture on the streets where they do business. It took Freeman many years of trying before she got Heather into treatment (again, we're only using Heather's first name to protect her privacy). Like any new parent, Heather hasn't slept much. "I'm forgetful," she says, "I cried yesterday because I felt like a bad person because I forgot his bottle." This is Heather's fourth pregnancy, but only the first child she's been able to keep since coming out of rehab. Others in her family are also addicts. She says the first person "to put a needle" in her arm was her father. 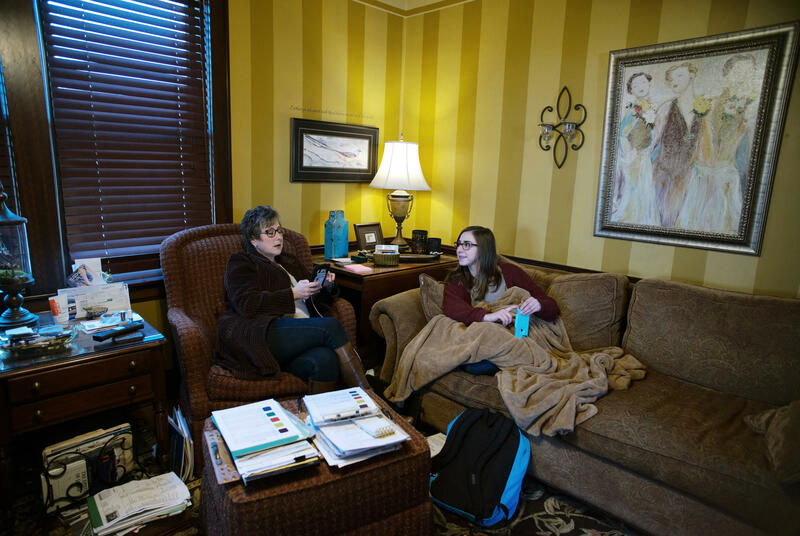 In the seven years since Necia Freeman has been trying to help her, Heather has been in and out of jail and relapsed after more than one treatment program. Heather says she couldn't believe Freeman kept trying to help her, even while she was in jail. "She was trying to help me get into rehab while I was incarcerated," she says. "They thought she was trying to help me escape or something." The two share a dark sense of humor that seems to come with the territory. But, in all seriousness, Heather believes Freeman is the reason she's alive. Freeman jokes that when she first started reaching out to addicted prostitutes eight years ago, she thought getting them into rehab would be easy. "I'm just gonna give 'em a brown bag lunch and a gospel tract," she thought to herself. "It hasn't happened that way. Not even close." But, in a town where so many people need help, doing nothing is not an option for Necia Freeman. Here's a number that shows just how bad the opioid crisis is in Huntington, W. Va. The rate of babies born there with a drug dependency is 10 times higher than the national average. We're going to meet two people in that community who have said, enough. Their methods of getting heroin addicts into recovery are unorthodox. One uses brown bag lunches and the Bible, the other an old black hearse and a casket. For our Take A Number Series, NPR's Elizabeth Blair reports. 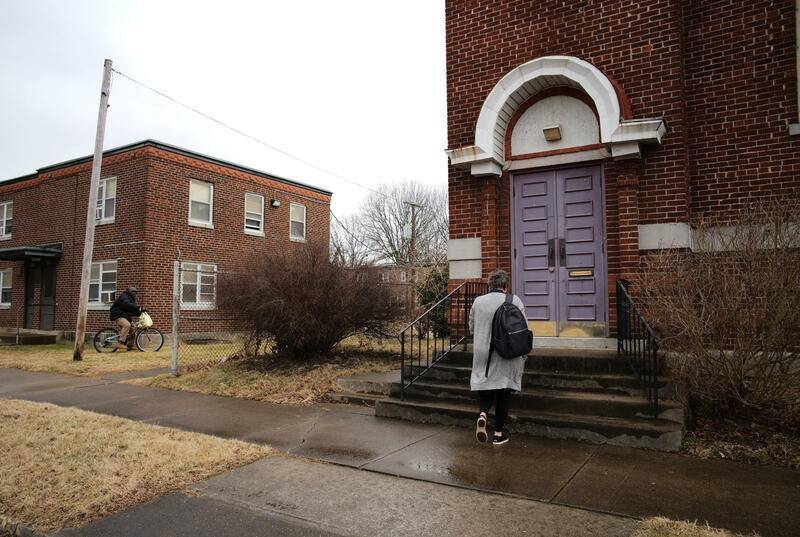 ELIZABETH BLAIR, BYLINE: It's an ominous sight parked in a rundown neighborhood where there have been a number of drug busts. A black Buick hearse with the words inject heroin, reject life stenciled on the side. On the back, it says heroin kills. Is this your last ride? DWAYNE WOOD: There's nothing around quite like this that I'm aware of. I wish they were on every corner. BLAIR: I meet Dwayne Wood (ph) from outside a building he's trying to turn into a community center for recovering addicts. It's about three miles from downtown Huntington. Wood drives the hearse thousands of miles through nearby Ohio and Kentucky to raise awareness about heroin addiction. BLAIR: Dwayne Wood grew up in Huntington. He originally bought the hearse to carry his motorcycle. WOOD: I love my Harley. How cool would that be to see those ape hangers sticking out the roof of a hearse going down the road? You know, cut the roof out. BLAIR: Ape hangers. I had to look that up. They're handlebars. But Dwayne Wood scrapped those plans when he turned on the radio on the drive home. WOOD: Radio airways once again filled with overdose and death. And that's when I knew the true calling of the car. BLAIR: The true calling of the car. WOOD: The true calling of the car. The car that was designed to haul death was revamped to give life. BLAIR: Huntington is a mid-sized, blue-collar town on the Ohio River where West Virginia, Ohio and Kentucky meet. It's home to Marshall University. A number of factors have contributed to the city's opioid crisis, including the loss of factory jobs, a depressed economy, a high addiction rate. There's a lot of work to be done. In about a year's time, he's gone from driving the heroin hearse to raise awareness to organizing fundraisers for treatment centers and talking to addicts directly, like Sarah (ph) and Thomas (ph). For privacy reasons, we're only using their first names. THOMAS: Dwayne's actually the one that got us into rehab, and here we are today. BLAIR: In 2016, police raided Sarah and Thomas's home. Child protective services took their two children. After serving jail time, they started using again. A neighbor suggested they talk to Dwayne Wood. SARAH: When I walked in here, he already had my Facebook page pulled up and pictures of my daughters. The first thing I seen facing me was my daughters. BLAIR: Dwayne Wood uses a combination of compassion and fear to get through to addicts. The room where Brooke (ph) saw her daughters' faces looks like it belongs in a haunted house. Black walls, a mock jail cell with iron bars and a black casket donated by a local funeral home. WOOD: This is where you'll make your choice of life or death. BLAIR: Do you remember what you thought when you saw heroin hearse? SARAH: I was scared. My first thought was, is he going to put me in this casket? Because I don't think I could do it. Thankfully, he didn't. And all it took was for me to see it. BLAIR: Now, there isn't a lot of research on the best way to get an addict into treatment. It's not clear if using fear works. And with his garish, black hearse, Dwayne Wood has his critics. But in a town like Huntington, W. Va., where resources to fight the opioid crisis are scarce, everyone needs to take ownership, says Huntington Mayor Steve Williams. STEVE WILLIAMS: When I hear individuals, they'll come and say two - one of two things to me. Somebody needs to do something. And I say, well, look in the mirror. But most people come and say, what can I do? That's heartwarming. BLAIR: Dwayne Wood figures in the last year, he's helped get 43 addicts into treatment. Some went to programs that included medication to beat cravings, others went to abstinence programs. Medication assistant treatment has a higher rate of success, but Wood says any treatment is hard to find. He doesn't know if the people he's helped are still in recovery. He says as a recovering alcoholic himself he's compelled to help addicts because he relates to them. WOOD: They had dope sickness. I had alcohol sickness. Same symptoms they've had when their legs were shaking and their stomachs was tied in knots and everything else that goes along with it. I've been there. I've been beside them. NECIA FREEMAN: We are all one bad choice away from being who we're helping. You know, one bad choice. BLAIR: Necia Freeman also lives in Huntington, W. Va. She and Dwayne Wood don't know each other, but she, too, spends a lot of time trying to help heroin addicts, specifically prostitutes working to feed their addiction. Freeman is a realtor. As we drive around, Freeman points out evidence of Huntington's opioid crisis. We pass a small building with the sign Lily's (ph) Place on the front. FREEMAN: Our neonatal unit is so full that we've had to open up a whole new facility called Lily's Place to take care of drug-addicted babies born here. BLAIR: Freeman is a devout Christian. About eight years ago, she started Backpacks & Brown Bag ministries. With help from her church, she delivers brown bag lunches and backpacks to poor children in local schools. And this is partly what led her to work with heroin addicts. One day she came across a small news item in the local paper that really bothered her. Just a couple of lines. The body of a known prostitute had been discovered in a cornfield near Huntington. She'd been shot. FREEMAN: It bothered me that that was the end of the story. So I was burdened for this woman that I didn't even know. And then come to find out a couple days later, she was actually one of the mothers of one of my backpack kids. BLAIR: Freeman realized the moms of some of her backpack kids also needed help. So now she gives brown bag meals and scripture to prostitutes. I meet Heather and her new baby at Freeman's church. HEATHER: And I'm forgetful. I cried yesterday because I felt like a bad person because I forgot his bottle. BLAIR: This is Heather's fourth pregnancy but only the first child she's been able to keep since coming out of rehab. Others in her family are also addicts. She says the first person to put a needle in her arm was her father. Heather has been in and out of jail and relapsed after more than one treatment program. She says she couldn't believe Necia Freeman kept trying to help her even while she was in jail. HEATHER: She was helping - trying help me get into rehab while I was incarcerated. And they thought she was trying to help me escape or something. BLAIR: Heather believes Necia Freeman is the reason she's alive. Freeman jokes that when she first started doing this eight years ago, she thought getting women into treatment would be easy. FREEMAN: I'm just going to give them a brown bag lunch with a gospel track, and they're going to get saved. When I get to heaven, they're going to tap me on the shoulder and say, oh, my gosh, you don't know me, but - and it hasn't happened that way (laughter). Not even close. BLAIR: But you get the sense that in a town where so many people need help, doing nothing is not an option. Elizabeth Blair, NPR News, Huntington, W. Va. Transcript provided by NPR, Copyright NPR.